This post was first published in January of 2014. If I remember right the only stipulations of the competition was that the piano sonata [movement] had to be under 5 minutes and it had to be played by memory. The judges were strict with the rules as I actually remember them stopping one contestant who had not finished by the 5 minute mark and wouldn't let them finish. My daughter's premiere piano teacher, Russian-American Mrs. Kurinets picked out the first movement of Haydn's piano sonata #23 in F-major for her to play. You can imagine the pride in my face as Ebony played it the best I had ever heard her, perfectly. And what a relief when it was over as my mother and me let out our breaths with happy smiles. As you may know, Franz Joseph Haydn was known as Papa Haydn as he was the father of the classical symphony. 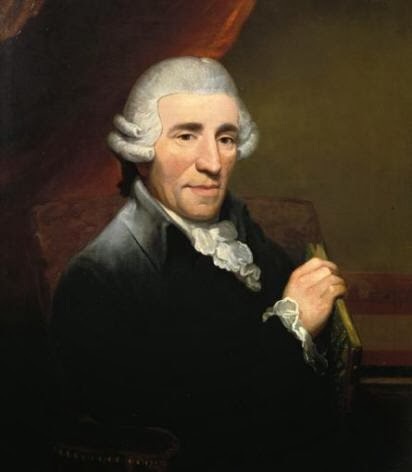 Haydn's importance in classical music was even much more than that as he was one of the developers of the string quartet and and of the sonata form [exposition-development-recapitulation] that would be used in many classical and romantic pieces of music. He also was a leader in the development of the classical piano sonatas with his plethora of wonderful sonatas. His piano sonata in F-major will always have a special place in my heart, with remembrances of my daughter's exceptional first place performance. What a beautiful testimonial to an intelligent, hard working, talented young woman that you and Sheralyn raised. The pride our daughters generate, in us dads, is not measurable. Thanks Brad and double that for you with your two beautiful daughters!!! Most young pianists have encountered that initial fear of speed while developing their technical skills. But I have found (in my first attempt at a Haydn sonata) that speed is almost essential not only to the quality of the sonata but also to its mastery. Now, it's just the first few notes (beginning the piece) that still make me anxious.